Every business owner should make an effort to grow their business. A growing business will get more customers and generate more revenue as time progresses. Taking advantage of the marketing opportunities on the internet is one sure fire way of taking your business to the next level. The internet has given small and medium-sized business a chance to compete in a leveled market. This is why it’s imperative for you to embrace digital marketing strategies. Digital marketing strategies can help you find more prospects for your products or services. In this article, we will take a close look at five simple ways digital marketing can help you get more solid leads and convert them into loyal customers. 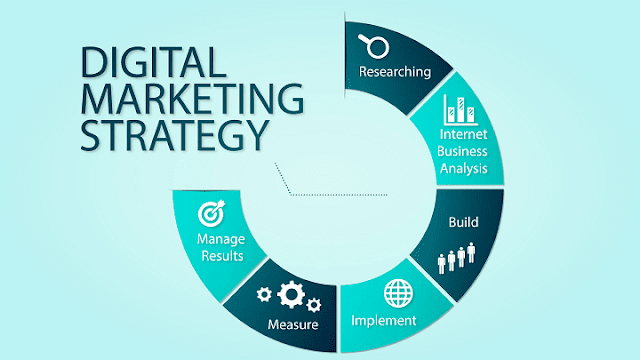 Let’s start and see the top 5 digital marketing strategies for business growth with examples. These will help you grow your business easily. Social media makes it extremely easy for you to expand your sales network and market to your targeted audience. For instance, bidvine uses popular social media platforms to connect with their targeted audience. Creating an account on a popular social media platform can help you reach thousands of prospects weekly. Your prospects will become paying customers if they like your content. They will also share your content with their friends. Establishing a solid reputation should be one of your top marketing priorities. Your targeted audience will not do business with you if they don’t trust you. Digital marketing will help you build a strong brand that your targeted audience will trust. An active blog and good web content will help you be seen as an authority in your business niche. Digital marketing gives you tons of flexibility. You will not be stuck with stacks of ineffective marketing letters and brochures on your desk. You can make changes or edits to your marketing content at will. This helps keep your content relevant. The days of sending out thousands of marketing postcards to prospects are over. The marketing world has gone through many changes over the years. Getting leads is one step to getting more customers, but your marketing efforts will fail if you are unable to get conversions. With digital marketing in play, you stand a great chance of getting customers that will grow with your business. It is a big mistake for you to take the shotgun approach when it comes to marketing your products or services. You should focus on marketing to prospects that are ideal for your products or services. Once you do this, you will get targeted results. Digital marketing will help you get targeted results. You can target specific geographic regions, demographics, and spending habits. With SEO and other effective digital marketing techniques at your disposal, you stand a great chance of doubling your customer base within months. It’s vital for you to take steps that will help your business grow. Digital marketing can help you get a sharp edge over your competition. You will get more customers if you use digital marketing techniques daily. At the end of the day, more customers will lead to more profits. If you are looking for more into the digital marketing tips for business growth, I recommend you going these free digital marketing course for beginners.